Auli is an important ski destination in the Himalayan mountains of Uttarakhand, India. 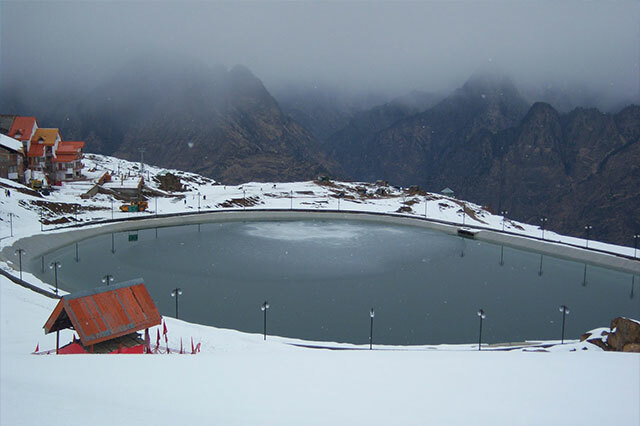 Auli, also known as Auli Bugyal, in Garhwali, which means meadow, is located at an elevation of 2500 to 3050 meters above sea level. 8 km from Joshimath is an ideal winter resort run by Garhwal Mandal Vikas Nigam (GMVN). A 3 km long slope ranging from a height of 2519 to 3049 m is a major attraction. The Auli resort run by GMVN has snow beaters which beat the snow to keep the slopes fit for skiing at all times. A 500 m long ski-lift carries skiers back to the slope top, thus saving them the trouble and time to bridge up wearing long skis.